Yes...continuing to play World of Warcraft. 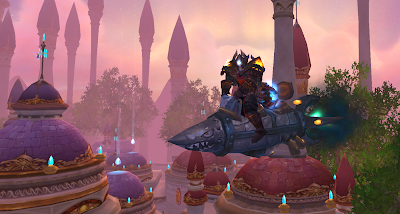 My 80th level tanking Paladin has a new toy. I got Scott signed up through Blizzard's refer-a-friend program, which netted me this cool two-seater flying mount: the Touring Rocket. Super-geeky...but I'm very happy to have picked this up! Well, the Kursk tank project continues...but I'll be weathering those vehicles for some time. Meanwhile our Warmachine/Hordes play group has decided to start a campaign. I've assembled a set of GW's Mighty Empires to create the campaign map. The terrain was painted very quickly with the airbrush, and then some extra time was taken up with brush painting the various cities, mines and castles for the map. The flags where painted with aerosol cans. For the campaign, each force starts with three home hexes. I'm playing Menoth, Scott has built up a respectable Skorne army, Casper and Robin are fielding Cygnar, and Elliot has Khador and Circle on the board. We started this week. Scott already has two victories (and two new hexes), and Casper has one. We are going to run the campaign until one faction controls eight hexes. The campaign rules are pretty simple. Holding a city allows a player to add +1 infantry point to his force. A castle gives +1 hero point, while a mine gives +1 warjack/warbeast point. The Kursk project continued this week with camouflage painting. I had a look through my references for German armor at Kursk and discovered that recent thinking and photo analysis shows that most tanks and assault guns fighting at Kursk were painted dark yellow with an overspray of olive green. Here is the current state of the project. Base paint schemes, tires, tracks and mufflers have been completed. In the back row, you can see there are four very different Tigers. The plane yellow and yellow/green Tiger are fine for Kursk scenarios. I also painted one for Normandy with a three-color scheme, and the final one with the red-brown paint scheme is intended for Polish or Baltic fighting in '44. I have two StuG III Gs still down in the basement getting repainted. My first take on their paint jobs was awful. Next up is a coat of gloss varnish, then decals, weathering washes and powders, and a final matt coat to finish them off. Well there's no use in having a new airbrush setup if I don't go ahead and start an insane project with it. A couple of years ago I collected German and Russian 15mm armies for a large Kursk scenario (July, 1943). I got a good portion of the way through the Russian forces, but stalled out on the Germans as my attention waned. I had brush-painted the majority of the armor force to the point of getting the base dark yellow color shaded and high-lighted. Honestly, it was a messy finish that I was never really happy with. The whole project went into the cupboard. So now it's time to resurrect this beast and do a proper job on the paint schemes. Everything started with a base coat of can-sprayed Tamiya dark yellow. Each piece then got a heavy wash of floor wax and black paint. After that was dry, everything received a highlight dry brush of lightened yellow. As you can see, the base coat, which would then have received camouflage paint, was pretty rough. This is where the project stopped a couple of years ago. However, now with the airbrush, the project is back on the table, and the base coats are now smoother...and I'm really looking forward to starting into the camouflage paint schemes. These are all the German armor pieces I'm working on right now. Base coats with preliminary shading have been redone, and it's time to move on to the camo. This assortment of 15mm pieces come from several manufacturers. Anything with a Pz III chassis is from Quality Castings, except for the StuG III Fs, which are the very nice models from Skytrex. The Pz IV Gs, along with all the tank destroyers, SdKfz 251s and Opel trucks are from Battlefront. The Tigers are the excellent models from Peter Pig...incredible, four different Tigers...so nice. Finally, the Kfz 10 and PaK 40s are, I think, from Quality Castings. Next up, I start into the camouflage painting, weathering and detail painting. Time to see what this airbrush can really do. Finished up a couple of lingering projects this weekend. First up is a unit of Daughters of the Flame...essentially a group of assassins for my Warmachine Menoth forces. I took another whack at Menoth White as the main color for this unit. Generally, I hate painting white because it's so difficult to work with. However, this time around I washed the base coat with brown and it actually turned out OK. I used Foundry Royal Purple for the cloth. I've also finished off two Menoth solos. On the left is an Order of the Fist monk. On the right is a Vassal of Menoth. These were very straight forward figs...nothing special here.